Location: Kirby Muxloe, Leicestershire, England. Opening times: Open to visitors on Saturdays, Sundays and Bank Holidays from 1 May until 31 August. 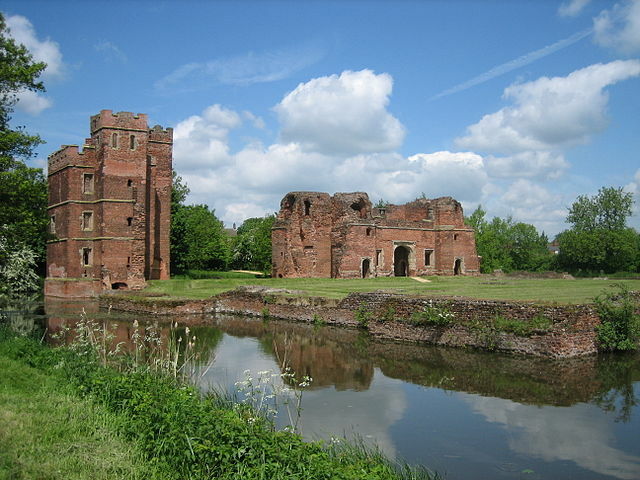 Notes: Kirby Muxloe Castle, known also as Kirby Castle is an unfinished 15th century fortified manor house in Kirby Muxloe, Leicestershire, England (grid reference SK524046). It was begun in 1480 by William Hastings, 1st Baron Hastings, during the period of the Wars of the Roses. He already owned a manor house on the site (some of the original manor house foundations are visible as ruins within the enclosure of the castle), for which he planned to totally redevelop. His ambition was to create a fortified residence on a rectangular plan enclosed by walls, towers and a moat. However work stopped at the castle when he was executed in 1483 for treason by Richard III and it was never completed. Parts of the castle were occupied by the remaining Hastings family members, but by the 16th century the site had been left to ruin. Visitor information on English Heritage website.